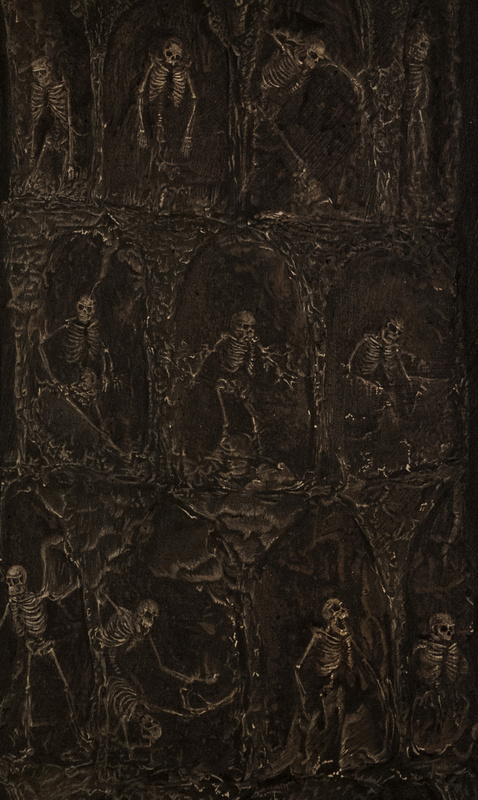 A little while ago I reviewed the recent tape by UK death metal act Vacivus. I picked it up from Goatprayer Records (who handled it's release earlier this year) alongside this tape. There's more to the link than just the label though! UK black metal duo Bone Tomb shares a member with Vacivus, as well as other varied UK underground metal bands and being a fairly new entity outright, the tape is currently the only way of hearing Bone Tomb's music. Tombs Of Blood features two original tracks and a cover, paying homage to one of Switzerland's finest! There are not many demos that begin with the impact that’s felt on Tombs Of Blood. The title-track wastes no time in enveloping you with ambient and atmospheric black metal. There are subtle choral parts, melodic guitars and icy shrieks. All you expect really. The pace is unrelenting too, while the keys employed throughout are used sparingly, so it’s less Dimmu Borgir and more Darkthrone (if you will). I personally think that both of those bands are slightly overrated and prefer black metal to be more obscure and original. Tombs Of Blood hits the nail on the head straight away. Bone Tomb’s second original track, Macabre Is Eternal provides a change of pace and atmosphere to begin with. Brooding riffs feature throughout, alongside very well-played lead work. This is somewhat murkier than the tape’s title-track, but that’s part of the fun. Bone Tomb’s eye (and ear) for progression is used to greater effect as well, with signature changes more obvious. For all of it’s dissonant and raw qualities, the music here is still very approachable and the production/mastering is very good. It’s good to hear a modern take on a classic black metal song. 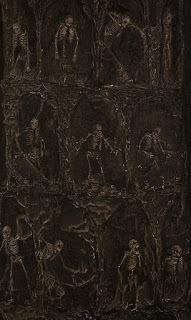 Bone Tomb doesn’t deviate from their blueprint and as a result make Sorrows Of The Moon sound like their own. In spite of the above mentioned comparisons, it is actually very hard to think of another black metal band that would sit right next to Bone Tomb. The original music is where it’s at for me, as it’s very creative and well-written. There are rumours abound of a 2016 full-length. Sing me up! Sadly, tapes have sold out for those that missed them.